Happy St. Patrick's Day is the message on one of these Irish decorations. The other two shamrock cutouts feature additional shamrocks in green on green colors. 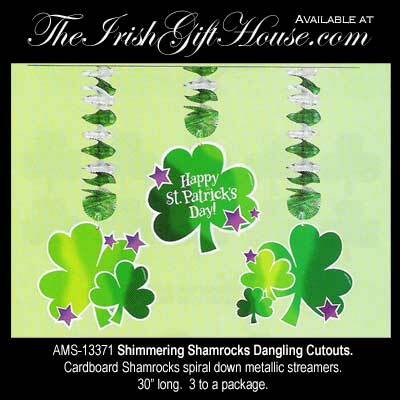 Shimmering shamrock cutouts spiral down metallic streamers in this St. Patrick's Day decoration from The Irish Gift House. Each of the 3 dangling shamrocks measures 30" long.